The first thing one should notice about Droopy McCool is that it is a Return of the Jedi era hardcopy and it is not cast in a green resin known as Dynacast. 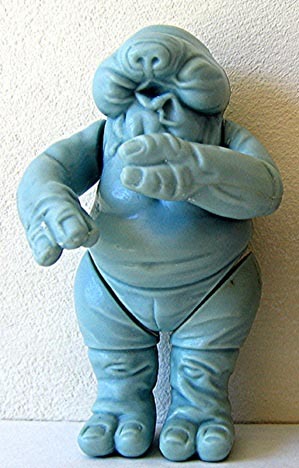 It's cast in a blue resin like many of the modern Kenner/Hasbro hardcopies. 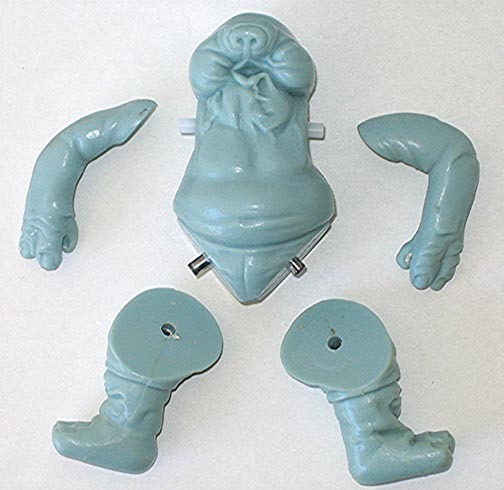 The fact is that Kenner did not start using any blue resin until about 1989, or about 7 years after this piece should have been made. This piece is what is known as a "Blue Harvest" hardcopy. Though most of the "Blue Harvest" pieces to turn up were Micro Collection 4-up's a good amount of 3 3/4" hardcopies also turned up. The second image shows a nice side by side comparison between the hardcopy and production figure. One should note that the hardcopy is slightly larger. As plastic cools there is a certain amount of shrinkage that goes with it. Figures are sculpted slightly larger to account for this and as a direct result the hardcopy will also be larger. Another great thing about hardcopies is the amount of detail that can be seen. It's unfortunate that some of this detail is lost in the translation to plastic but hardcopies are a testament to the fine work that Kenner's sculptors did. The final shot shows the figure disassembled. Hardcopies can be pinned with both plastic and metal dowels. This example utilizes both. Please bear in mind that although this is an interesting piece to look at it is not a true hardcopy in the production sense of the word. 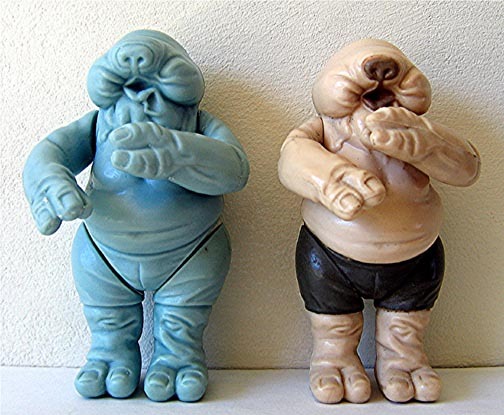 "Blue Harvest" pieces do make for an interesting way to have a representation of that step in the production process but no blue piece was ever used to actually create the toys. They are all reproductions and employees lost their jobs for perpetrating this fraud. If you ever purchase a blue piece please remember what it is and remember that something like this is only worth a fraction of what a real hardcopy would sell for.